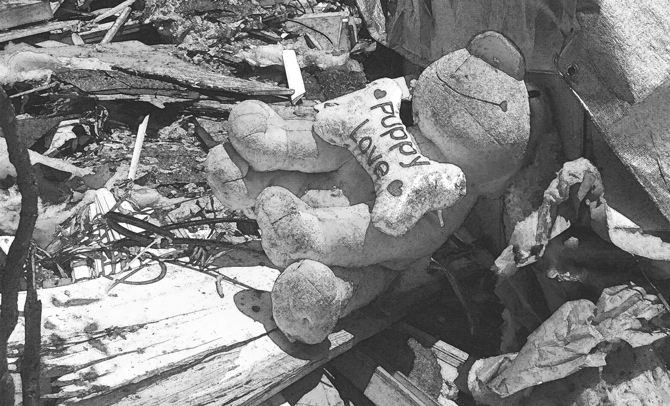 When Disaster Strikes, Is Your Family Prepared? A high school student and a camp counselor, this teen has CPR, wilderness first-aid, and CERT (Community Emergency Response Team) training. That training has taught her a valuable lesson: Accidents and disasters can happen at any time without any forewarning. Unfortunately, a lot of people in Virginia “aren’t prepared for emergencies,” says Laura Southard, public outreach coordinator for the Virginia Department of Emergency Management. This RVA teen stays prepared by having an emergency kit with her at all times. The kit is filled with everything from first-aid supplies, food substance bars, and a pocketknife, to a CPR mask, salt and sugar for treating heat exhaustion, and a space blanket that can be used either to reflect or absorb heat. When she carries the kit to school she takes only appropriate items, leaving out the pocketknife and any medication. She also has helped her family create a home evacuation plan as well as determine a meeting point if they get separated. “My family is prepared,” she says. Neighborly rescue efforts underway after a flooding emergency. all hazards approach,” Southard says, referring to disaster planning. An emergency plan should also include outlets for family communication. When there is an emergency and local phone lines are down, there is a chance a long distance call can be completed. “Everybody should have an out-of-town family contact and every member of the family needs to know who to contact,” Southard says, adding that the contact person can relay information to other family members. Because of today’s emphasis on technology, most families have their contacts stored on their cell phones, not written down on paper. But it’s important to have the contact information of key people, everyone from family members and pharmacists to doctors and veterinarians, on a sheet of paper that is posted in the house, in everyone’s car, and at work in the event that the power is down and there is no access to a cell phone. Families should also designate a meeting point where they can reunite if they are separated and can’t get back into their neighborhood. “For my family, it is the elementary school a few blocks away,” Southard says. Students demonstrate proper technique during a statewide tornado drill. To be prepared for those “what ifs,” families should always have an emergency kit of supplies on hand. The items in that kit will look different for every family. If you have a baby, for example, you will need an extra supply of formula or diapers in your kit. If you are an older individual, you may need to have an extra pair of glasses in the kit as well as an extra prescription of every medication you take on a regular basis. 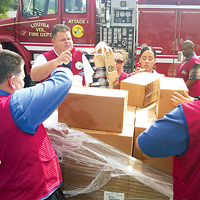 More generic items include flashlights and batteries as well as first-aid supplies. “In the first few hours of disaster we need to take care of ourselves because first responders need to take care of people that really need it,” Southward says. Not all disasters are natural. 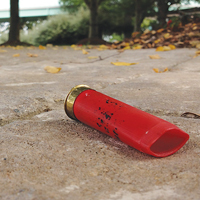 Shootings and bombings are a reality in our country. When it comes to weather emergencies, “never say never,” she adds. In the last few years, Virginia has seen an increasing number of significant weather events. Hurricane Irene in 2011 resulted in the second highest power outage in Virginia’s history, and the violent and long-lived line of storms in 2012, called a derecho, resulted in the state’s third-highest power outage. “People aren’t prepared to be without electricity for a week or two weeks,” Southard says. 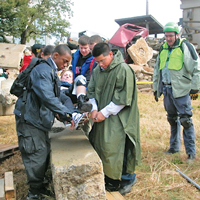 Disaster simulations help prepare first responders and community members. The organization’s emergency preparedness apps can be downloaded at redcross.org/mobileapps. The hurricane app, for instance, is designed to give families step-by-step instructions on what to do before, during, and after a hurricane. “People need access to information,” McNamara says. The apps are location-based and will update you on watches and warnings in your area as well as the location of gas stations and shelters. They also have a tool kit with a flashlight, audible alert, and strobe light. In addition, you can post messages on the apps to let everyone on your contact list know you are okay. Easy access to emergency supplies is important for first responders. If students are on field trips, county bus drivers are advised whether to return them to school or take them to a predetermined area of shelter such as another school or church. “We have had to do that before,” Bailor says. for a change in plans,” Bailor says. School nurses are required to bring a defibrillator outside during an evacuation, even if it’s a drill, in the event that anyone suffers a heart attack. Each school has at least one defibrillator. Larger schools have up to seven on hand. Portable defibrillators are always taken to any sporting event as well. Allergic reactions are another concern for school systems. In Henrico County, each school is outfitted with at least two EpiPens in the case of severe allergic reactions. In addition, students who have allergies are encouraged to bring their own EpiPens to school. No parent wants to think that his or her child’s school could be a victim of a school shooting, but in today’s world this is another form of disaster for which school personnel and students can prepare. Henrico schools hold drills to prepare students to respond quickly to a school shooting. “We collaborate with the Henrico Police Department. They conduct active shooter training for us at every school, with every student and staff member,” Bailor says. 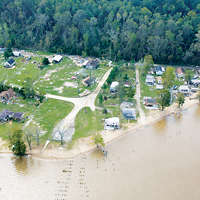 A view of flood damage along the James River after Hurricane Isabel in 2003. Consult the family emergency plan checklist below, provided by the Virginia Department of Emergency Management. The department also has lists for older Virginians, people with disabilities, and pets at readyvirginia.gov. • Discuss with your family, friends, and neighbors the types of disasters and emergencies that are most likely to happen and what to do in each case. •After a disaster, it’s often easier to call long distance than to get a local call to connect. Ask an out-of-town friend or relative to be your family emergency contact. All family members should call this person in an emergency to check in. • Be sure every member of your family knows the phone number and has a prepaid phone card to call the emergency contact. • You might have trouble getting through, or the telephone system might be down altogether, but be patient. • Take a first aid, CPR, or other class so that you have the knowledge to help yourself and others if needed. • If you do not own a vehicle or drive, learn what your community’s plans are for those without private transportation now, before an emergency. Contact your local emergency manager to learn about plans in your area. • Decide now where you and your family will meet in case you can’t return home because of an emergency. Keep a record of the location’s address and phone number, as well as the phone numbers of your family, with you at all times. • Make a visual or written record of your possessions to help you claim losses in the event of damage. Include photographs of cars, boats, and recreational vehicles. Get professional appraisals of jewelry, collectibles, artwork, or other items that might be difficult to evaluate. Also, photograph the exterior of your home. Include the landscaping that might not be insurable but does increase the value of your property for tax purposes. Make copies of receipts and canceled checks for valuable items. • Make a plan for your pets. Include supplies in the emergency kit. If you evacuate, take your pet. 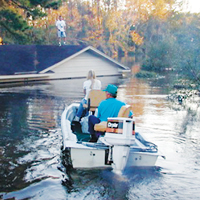 • Talk to your neighbors about how you can work together during an emergency. Find out if anyone has specialized equipment like a power generator or expertise such as medical knowledge that might help in a crisis. Decide who will check on elderly or disabled neighbors. Make back-up plans for children in case you can’t get home in an emergency.